SEA APARTMENT The apartment we offer, bright and completely renovated consists of: living room with open kitchen and sofa bed chateu d'ax, bathroom (with shower, bidet and window) and, on the mezzanine, 2 bedrooms : a double room with a small bathroom in the room (complete with shower, bidet and window) and a bedroom with a sofa with a pull-out bed. The bedrooms are separated by a built-in wardrobe and a door and overlook the living room so they are not totally independent. The outdoor terrace, complete with table and chairs, is available to guests but is not independent. The apartment is 34 steps from the street. The apartment, despite not having a sea view, enjoys a strategic position because it is located near the beautiful square of Atrani, a meeting place for young people and people who like to relax with a drink, accompanied by typical local dishes. From the square you can directly access the beach, which offers the possibility to choose between the free beach or the comfort of the private beach. A few meters walk is the most famous Amalfi, from which ferries depart for the most beautiful beaches of the Amalfi Coast, reachable only by sea and also ferries to Positano, Capri, Sorrento and Cilento. The price includes: costs for utilities, initial and final cleaning, supply of linen and sheets. Tourist tax € 1.50 per person per night. As regards the possibility of parking, unfortunately the free parking spaces are very few, unobtainable. The municipal parking in the street is very expensive throughout the Amalfi coast (from € 3 to € 5-10 per hour). So maybe it's better to forget the car! For those who can not do without it, not far from the apartment there is the garage Lunarossa about € 20-25 per day (€ 13 per day in low season) that I recommend to book online from the dedicated site. My mother and I visited the Amalfi Coast for her 50th birthday and she loved this vacation home! It was well kept, sunny and the neighbors were friendly. The town of Atrani is super small and cute with local places to buy groceries and eat out. Our host Maria Teresa was very responsive when we had a couple of issues. 1) More than likely, you'll arrive in Amalfi (major town next door) and you'll need to get your luggage to Atrani. Note that it will cost you at least 30 euro for the less than 5 minute ride in a taxi. There's no other option. 2) This vacation home is up a hill and then 2.5 flights of stairs. My mom and I were in Italy for 2 weeks and had a lot of luggage. 3) To go to other towns along the coast, you'll need to go into Amalfi which is a 15 -20 minute walk that includes an uphill hike, then a flight of stairs AND THEN across the highway to the tunnel (entrance next to the parking garage at the top). You'll definitely need walking shoes for that. Dear Madam, I'm glad you spent a nice time at my house. I'm sorry that he had problems with suitcases. Unfortunately, I had too little time to give you a cheaper alternative that I would have gladly found. I had however indicated the presence of buses from Atrani to Amalfi for only € 1.
it is the conformation of the territory that creates discomfort but at the same time makes the Amalfi coast a unique place so beautiful! We stayed 5 nights in that apartment. It's 5 minutes walk from shops, restaurants and the beach. It was clean and well equipped. Atrani is great place to stay as it's very close to Amalfi (10 minutes walk), but it's much quieter. The only problem was the town clock (located nearby the apartment) that was ringing every 15 minutes (also during the night). Except of that our stay was perfect. Dear Sir, I am truly sorry that you have had problems. The apartment is not at street level but there are about 25 steps to reach it. On the website this is reported and I'm sorry that I did not emphasize this aspect. We are used to reach homes with 400-1500 steps. So for us a house with only 25 steps is very convenient! About the parking I always do not recommend to come by car because I know the problems here (traffic, impossible to park easily and for free). Close to the apartment I had proposed the Lunarossa garage (more easily accessible but much more expensive) or a less expensive but more distant place (exactly 1.5 km - not 3 km - from the apartment. You can also reach it by bus). I realize that this caused inconvenience, but on my part I have always been very clear about it. The Amalfi coast is also famous for expensive and difficult to find parking! Thanks anyway for your review. Every criticism for us is a reason for improvement. Great apartment and wonderful hosts. A perfect stay in Atrani! As a family of five we loved this apartment. It had a very convenient location, lots of space and we felt right at home. 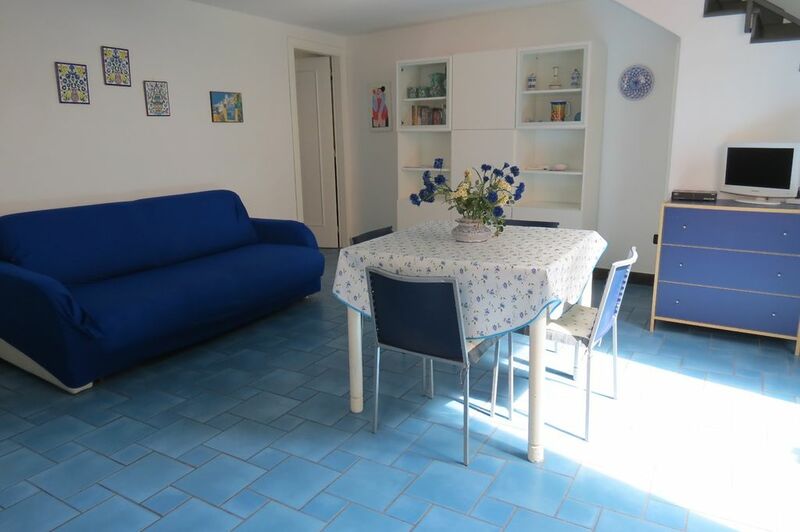 The apartment is located in Atrani, a very suggestive little town of the Amalfi Coast, a charming ancient fishermen's village and historical residence of the doges. It is very close to the characteristic square from which, going under an arch, you could reach the beach. So the house is situated in the very centre of life: bar, shopping, mini market, restaurants, farmacy, ..everything near-at-hand! It is very easy to reach all the most beautiful place of the Amalfi coast: only few meters for Amalfi, some km for Ravello, Positano, Sorrento.. By boat it is possible to reach the famous Capri and Ischia Islands and the wild Cilento Coast. In the Amalfi coast you can eat local dishes and seafood fresh, in restaurants on the sea too. Between the best clubs there is certainly the "Africana", as taken completely out of the rock and sea view, in the summer can also be reached by sea. In the Christmas time Atrani assumes the appearance of a crib and, the night of Christmas Eve, becomes truly magical with the fallen star. The New Year's Eve, the square of Atrani becomes a disco, meeting place for all young people. Notable are also the Easter holidays with the procession of flying and the procession of Jesus died on Friday. In June, the feast of St. Andrew in Amalfi, will leave all with bated breath for the "rush of St. Andrew" for the steps of the cathedral and the beautiful fireworks, on the sea. On July 22 there is the party of Santa Maria Maddalena in Atrani, so you enjoy unforgettable moments with fireworks. In August, there is the festival of blue fish to Atrani and "Amalfi by night" in Amalfi, where you can find entertainment between the alleys of Amalfi and taste local products. In September is the Byzantine New year to Atrani, in which is crowned a personality in the world of culture as honorary doge. Also in September to Minori there is "Gusta Minori", which offers fantastic performances and unforgettable scenes, accompanied by a gastronomic journey. Unforgettable are the fireworks in Torello, to be admired from the nearby Ravello. From June to October there is the fantastic and famous "Ravello festival". Caparra richiesta alla prenotazione. Prezzo per 2-4 persone. Per ogni adulto in più si paga 100€ in più (max 6 persone) L'aria condizionata non è compresa nel prezzo (su richiesta +20€ a settimana). Price for 2-4 people. For each additional adult is + € 100 (max 6 people) The air conditioning is not included in the price (on request + 20 € per week). Prix pour 2-4 personnes. Pour chaque adulte supplémentaire est facturé € 100 Plus (max 6 personnes) L'air conditionné n'estt pas compris dans le prix (sur demande + 20 € par semaine).